We can be deceived by popular images. Every now and again a religious CD gets into the charts, a CD of Gregorian chant maybe. People who are bored by the Spice Girls turn instead to the Incense Boys. And religious pundits greet the news by babbling away about how it all reveals a deep spiritual hunger. to people caught in the rat race! It used to hear nuns chanting and say how cold and fruitless. Now it seems to hear monks chanting and say how cool! fine for them: irrelevant for me. Surprisingly topical in view of the signing by Decca of the nuns of L'Abbaye de Notre-Dame de l'Annonciation near Avignon but clearly dated by the reference to the Spice Girls, those wise words come from a sermon by Father Cormac. As Cormac Rigby he was presentation editor of BBC Radio 3 from 1971 to 1985, and was a Roman Catholic priest from 1988 to his death in 2007. I post the words today not for their topicality, although they certainly do not lack that, but for their style. The text comes from a remarkable series of little books of Father Cormac's sermons that transcribe his notes without editing or re-formatting. Cormac Rigby was presentation editor at the BBC at a time when precision and clarity mattered. Anyone can deliver the text above and make it sound professional and convincing, just try reading it aloud to confirm this. If you have any involvement in presentations or if you simply revel in the power of words, these little books, which can be picked up for pennies, are a must, whatever your religious persuasion. In the undated (early 1970s?) 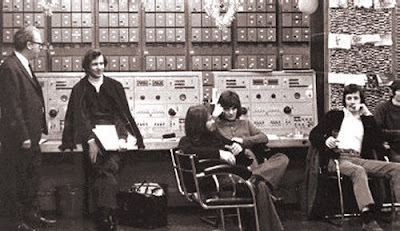 header photo taken at Broadcasting House Cormac Rigby is second from left . Read more about him in He was in every sense a good man. * Cormac Rigby can be heard as one of the two readers in the Chandos recording of Britten's The World of the Spirit. Heavens! (if you'll pardon this rather topical exclamation.) Thanks for solving a mystery, Pliable. I had wondered for a long time what had become of Cormac Rigby and his superb voice.